I can personally imagine a world where I can get anything whenever I want it. Can’t you? In 2015 we’ve seen a proliferation of successful on-demand companies, whether it’s Shoes of Prey, where you can design and order your own shoes, or Blue Apron, that delivers pre-determined ingredients so a consumer can make themselves the perfect meal. Even airports realize on-demand and no fuss services makes for happy customers and big profits. For example recently on a layover at Newark International Airport I ordered a turkey wrap from an ipad and only interacted with a person who wanted to see the proof that I had paid–they then handed me my wrap. The entire Newark International Airport is littered with ipads. It’s eerie that there are very few humans actually working at the restaurants at all. But it’s a taste of the future. In fact being able to order what we want when we want it is the future of consumerism. Today it’s becoming easier than ever to get our preferences delivered to us directly whether we’re at a fast food restaurant at an airport, or even at work or at home. Earlier this year in her “Internet Trends” report, American venture capitalist and former Wall Street securities analyst Mary Meeker highlighted various “just-in-time” companies, mostly from the sharing economy, however there is a growing interest in on-demand companies of all kinds—even liquor. Mary Meeker cites a few reasons why on-demand services have taken off in the last few years that include, “smartphone adoption, mobile payment platforms and social authentication.” Additionally the way millennials prefer to work–and the on-demand work suits millennials. The same report argues that changes in connectivity and commerce impacts the ways people can work, but it’s still early in the game. So now we have a proliferation of social networks, we have a proliferation of content sites, but we don’t have a ton of brands that marry both. How about companies that bring back-stories to whatever it is they help you create? There is a large maker movement happening today where people want to create their own stuff. Just because we can get anything pre-packaged or set up doesn’t mean we (especially millennials) like it that way. While some in the “Maker Movement” might be only referring to 3D printing or tools to make technology and robots, it also speaks to a growing interest in returning to creating all kinds of stuff–at home. These stories and content build community and create a direct connection to whatever it is you build-with the ingredients provided to you by the on-demand company. I won’t go so far as to call this a “back to the land” movement but I will say people are interested in doing things that come with a story—that have special meaning—that takes a certain amount of personal effort. According to TIME magazine there are approximately 135 million U.S. adults who are makers, and the overall market for 3D printing products and various maker services hit $2.2 billion in 2012. That number is expected to reach $6 billion by 2017 and $8.41 billion by 2020. In a sense the on-demand market can be seen as parallel to the idea of the maker movement. Some of the smartest companies are not only building a following with an on-demand product and services model, they’re also building wildly imaginative stories that accompany these ingredients. They’re empowering consumers to create their own imaginative things. For example, it’s possible that for my next cocktail party I will go on Pinterest, find a recipe I like and then head to the store to buy the various liquors, juices and sodas. However, what if you could find the recipe and have the alcohol delivered to you? What if that recipe was created by your favorite mixologist? This is precisely why the new on-demand liquor company Thirstie has had a ton of early success. Devaraj Southworth–CEO of on-demand alcohol company Thirstie–believes catering to the millennial is about much more than speed of delivery. With Thirstie it’s about engaging the customer on a higher level, not speed. For Thirstie it’s about educating the consumer on what the product is about. What can you make at home with the product? They’ve put emphasis on not just a marketing platform to deliver the consumer the bottles of alcohol ordered in under an hour, but they focus on the content and community part of it. They launched The Craft on their main website www.Thirstie.com—an editorial platform, in June 2015. The time spent on the Thirstie site went from 20 seconds to 4 minutes and 30 seconds. Clearly the millennial wants to learn about what they can make and what they can do on a hyper local level. According to Southworth, Thirstie believes in educating the consumer at the right time and the right place. In studies conducted by the company consumers want to feel “in the know” about trends. For example a trendy mixologist at a restaurant in Harlem, born in Australia–that was a producer of an amazing tequila–might guest post on their content site The Craft. Then the company Thirstie will deliver all the ingredients so readers can replicate the same cocktail recipe from that mixologist. Thirstie said adding recipes to their app increased engagement by 70%. Devaraj Southworth is the CEO and Co-Founder of Thirstie, a leading national on-demand liquor, wine, and beer delivery company with a content driven commerce platform. Devaraj has been a leader in business, online media and mobile technology for close to 20 years, and is a serial entrepreneur with a number of successful ventures to his name. 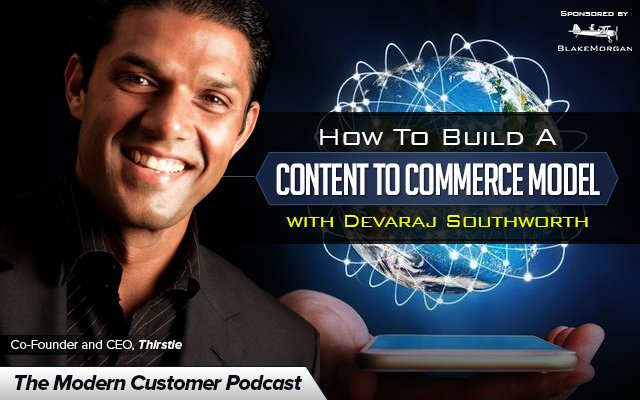 Prior to Thirstie, Devaraj built a digital agency to over $10M in sales, sold the Creative Services BU to an Inc. 500 Company, was a VP of Mobile Strategy for Amex, and is a former Deloitte and Accenture Strategy consultant. Devaraj studied Organizational Psychology and Investigative Journalism at Ohio Wesleyan.